The Gallipoli Campaign  was an Allied attack on the Gallipoli peninsula during World War I. The campaign took place between April 25, 1915 and January 9, 1916. The Allies, the British Empire and French forces, were fighting the Ottoman Empire. The reason for the campaign was to break the stalemate on the Western and Eastern Front and to help the Russians. The campaign started with a naval attack along the Dardanelles. Naval mines sank or damaged several ships and soon the Turks fought back and stopped the Allies from entering the Sea of Marmara. It was decided that if the Russians were to receive any British help, a land invasion was necessary. 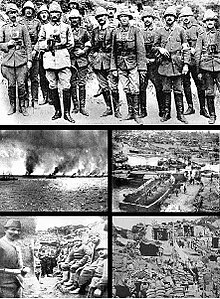 On April 25, 1915, Allied forces landed at various locations along the Gallipoli peninsula. Many British soldiers were landed in the wrong places resulting in heavy casualties. The British landed at Cape Helles and the ANZACs landed at a place later known as Anzac Cove. However, the Allies did not push on. Instead, they were told to dig trenches and wait for a Turkish attack. There was trench warfare until an evacuation of all Allied troops was finally ordered. The campaign is widely viewed as an Allied failure. The British historian A.J.P. Taylor wrote this of the Gallipoli campaign: "The Gallipoli expedition was a terrible example of an ingenious strategical idea carried through after inadequate preparation and with inadequate drive." Mustafa Kemal Atatürk led the Turkish defenders. It was the only big victory in the war, and he became a hero. Years after the war ended, he became the first president of Turkey. He paid tribute to the ANZAC soldiers who died there. ↑ Taylor, A.J.P. (1963). The First World War: an illustrated history. Penguin. p. 104. This page was last changed on 16 August 2018, at 15:55.